Although I have written critically of Van Til’s critique of Barth, I appreciate his contribution and general approach to apologetics. I recently looked a bit at Christian Apologetics, a revamped version of his syllabus for his apologetics class at Westminster, edited (and helpfully introduced) by William Edgar. 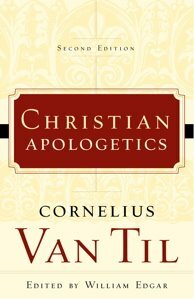 Edgar describes Van Til’s presuppositionalism as rooted in his desire to be rigorously and consistently reformed – and thus God-centered – in his apologetical method. In other words, for Van Til, reformed theology + apologetics = presuppositionalism. Obviously, reformed theologians more inclined to classical apologetics disagree! I am fascinated by this discussion, and want to learn more. My most fundamental question, and a question I see at the root of the whole debate, is this: can you argue for Christianity without presupposing God? Van Til seems to answer this question in the negative on the grounds that you cannot argue at all without presupposing God, because factness and argumentation are themselves unintelligible apart from God. Rationality itself must assume God. God is the context of everything, including ideas. Gavin,If you want to see (or I guess hear) an example of the presuppositional method at work, you should check out Bahnsen’s debate with Gordon Stein over the existence of God. Bahnsen uses the transcendental argument which is a form of presuppositional argument. Penny, thanks – do you know where I could find it? It’s also available on youtube – look for user gregbahnsen. The debate is poste in full, and there are many other courses (some with video) from Bahnsen available as well. Factness and argumentation are themselves unintelligible apart from God?Restated:Without an illogical conclusion of an absolute truth we have no initial fact or facts to build on and argue about?Kinda nihilistic but it could hold water.